Dan Teasdale, one of the original designers of Rock Band, is leaving the music game business behind. We all get bored from time to time, even people whose jobs seem amazing. Actors famed for their exciting action movies will make family comedies, bands will indulge in strange audio experiments, and game developers join indie studios - developers like Dan Teasdale, who has quit Harmonix for greener pastures. 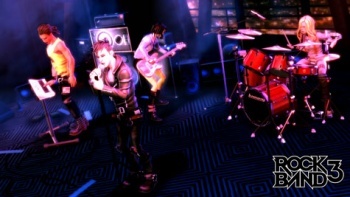 Writing on his blog, Teasdale said that while his time at Harmonix had been very fulfilling, Rock Band 3 was too big a game, and too big a team, for him to be as hands on as he wanted. "This realization put me in a weird position: I want to be able to help drive the vision and direction of a game, but at the same time be hands on and physically implement and iterate on the low level of making games in a more substantial way than time affords me when working as a lead on multi-hundred person titles." So Teasdale has left Harmonix behind and joined 'Splosion Man and The Maw developer Twisted Pixel, where he describes his new project as "ridiculously cool": "It's the holy grail of game design positions - I'll get to contribute and help drive the direction of a well funded and supported new title with a close knit superteam, while at the same time being hands on and able to directly impact all aspects of the game." Dan's last game for Harmonix, Rock Band 3, is due for release over Christmas this year.